We have been almost at the end of 2012 and 2013 is coming. All of us have survived that ridiculous doomsday and now we are preparing to celebrate the new year with a lot of expectations. As a way to say thank you to all of our readers in the last year, TechWalls is partnering with CravingTech and DragonBlogger to hold the Google Nexus 7 giveaway. We choose the Nexus 7 because undoubtedly this is the best Android tablet of the year. You almost can’t find a better tablet at the price range of $200. We considered tablets like Samsung Galaxy Tab 2, Amazon Kindle Fire HD or Nook Tablet HD but they absolutely can’t beat Nexus 7 in both performance and functionalities. Nexus 7 is equiped with a stunning 7-inch display, powerful quad-core processor so that you can enjoy the best experiene for high-end gaming and entertainment. I am using a Nexus 7 right now and this is the best tablet I’ve owned, it is perfect for relaxing, reading books, browsing web, watching a movie, or playing a killer Tegra 3 game. It is easy to enter your entries for the giveaway, check out details below. The giveaway will begin at Dec. 24, 2012, 4 a.m. (UTC) and ends at Jan. 8, 2013, 4 p.m. (UTC). Winners will be selected randomly from eligible entries submitted during the period. 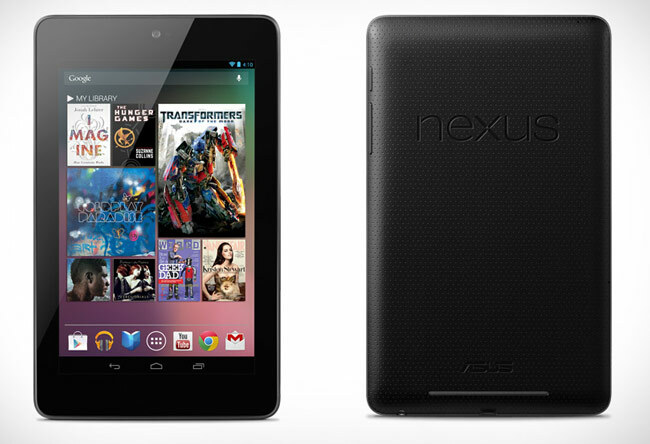 The winner will be announced on January 10 and receive the prize of Google Nexus 7. Note: The giveaway is available for worldwide Internet users, however, we can ship the tablet to U.S. residents only. Participants outside the U.S. will receive $200 sent through Paypal. It is quite simple to enter the giveaway. You just need to submit your entries in the widget below. The more entries you submit, the more chances you could become the winner. Good luck to you all. Update: The contest has ended and we chose the winner here. I am using a cheap :( Compaq! Need to win the super one you are giving away! Don’t have a Tablet – but would Love One! My current laptop is 7 years old and failing. I don’t have a smartphone either. Winning this would make my year. I don’t have any smarthpones, so I’ve decided to win this at least. But my bad, I’m from India. Hoping that I win the other prize and also the admin to send nexus(if someone) wins outside US. I would love to win this Nexus 7. I do not have a tablet, and the Nexus 7 would help me close deals at coffee shops and restaurants. The Nexus 7 would make it possible for me to display my web design portfolio while on the go. With the WiFi capabilities I wouldn’t even need a data plan. I don’t have any tablet at the moment so want to win this awesome Google Nexus. Thanks for the giveaway Hope to win. I would love to win this, Tuan! I have the ipad 2, very discouraged with Apples limitations, Its time to step away from the fruit tree and move on. Currently not using any tablet but would love the new nexus 7! no tablet, exactly why I NEED this one! It would be great to win the Nexus 7 ! I could take it on the go, great to read a book in the airport, on the beach, take it to class, read durirng lunch at the cafe! The tablet I’m using is a stone tablet :P..I’d want to win the Nexus 7 so I can join the 21st century and see what all the hoopla is about. Wow, I was waiting for this giveaway. However, this tablet costs about 15k INR in India, I guess. Anyways, I’m surely going to try my luck :). I suppose 15k INR is more than $200. I wish I could ship the device to participants outside the U.S. Anyways, good luck to you, guys. Yeah, it’s around $300 approximately. Awesome giveaway! I don’t have any tablet at this time, but I am big fan of android devices. I Want a Nexus 7 because it’s one of the bets Value for money Tab’s around. The 7″ Size is appealing and easy to hold in one hand and swipe with another. I Would use it for day to day usage such as checking my e-mails, web browsing and other stuff. I don’t own a tablet but would love to win one. Great and Awesome Giveaway Tuan. Entered and Followed all the Steps of PunchTab. I am eagerly waiting to win this and 2013 will be awesome. Thanks for supporting our giveaway. I am not using any! I like giveaways, have entered into it. Lets see who wins. Hope for the best!!! I have a Kindle Fire. I love it for books, but it doesn’t support near as many apps as I’d like to have. I have no tablet, that’s why I want nexus 7. I do not own any tablet, thus I want one. Nice giveaway please count me in. thanks for the opportunity to win. Thanks for joining the contest. I’m using Ipad 3 and it’s i would like to have an andriod tablet too for my software development skill. Have no tablet yet.. hoping to win this one.